A basic introduction to the theory and practice of safe seamanship in a small powered craft. The course will provide an introduction to boat handling skills with plenty of time afloat in addition to essential theory ashore. This course is now available for young people of 8 years and above. 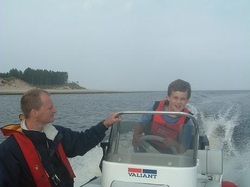 This course is a great starting point for kids looking to get into powerboating. Duration: Minimum of 1 Day course. Launch and recovery (8-11 year olds observe). Preparation of boat and crew, boat handling, picking up and securing to a mooring buoy, leaving and coming alongside, being towed. Minimum age: 8 Years. Candidates under the age of 16 will be issued with an endorsed certificate.